It started out as a way to visually bookmark images, articles, and links, but quickly became one of the most popular social media channels. Today, Pinterest has built on its foundation of personal sharing to become a platform for community sharing, one that can play a major role in community building for brands. Whether you’re a small business or a large organization, Pinterest is an important channel to incorporate into your social media strategy. The highly visual social network allows you to connect with your following in a personable and engaging way, while building relationships that can benefit your business. You can’t act alone to build your community; your followers need to be active participants in the process. Your role is to enable and incentivize followers to take part in pinning activities. Create boards that are open for anyone to pin to. Host contests that require people to pin their own photos to a board in order to enter. Include pinning activities in overall advocacy programs. This kind of two-way engagement will encourage more people to join your community. Many businesses make the mistake of casting out a wide net of content in the hopes of attracting as many people as possible. You want your Pinterest boards to be focused on a very specific audience. This ensures that your community will actually be interested and engaged in the content you share. At the same time, you want to share a variety of content within your niche to keep people interested and entertained. And take the opportunity to curate great content from other sources as a way to reciprocate. You need to approach Pinterest with a tone that fits the social network: approachable, interesting and fun. Unlike LinkedIn, your Pinterest activities should leave the very technical and very business-oriented content behind in favor of more shareable and visual content. Don’t be afraid to use humor in your engagement with your Pinterest community. Share information that shows the personality of you and your business while aligning to the audience’s care-abouts. Your community will appreciate your openness. As your community grows, you’ll be exposed to the successes of your followers. Don’t just congratulate them, highlight them for the rest of your community. Not only will those community members appreciate your acknowledgment of their success, each of these stories will contain lessons that other people can learn from and use. You should always be tracking your pins and those of your community. See what’s working and double down on it. Engage with community members who are engaging with you and learn from their own posts and comments. Your community will become the best source of information on what you’re doing right. Use that information in order to attract even more followers, creating a circle of community growth. How are you leveraging Pinterest for your business? During the upcoming Social Media Marketing World conference on March 25-27 in San Diego, California, we will dive into the different ways Pinterest is helping businesses achieve their business goals. 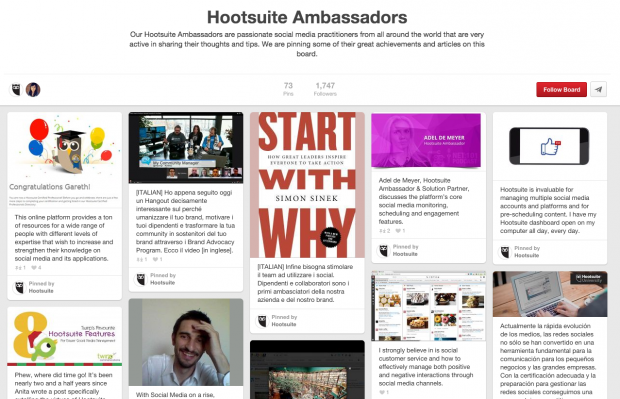 As we get the conversation started, here’s an inside look at Hootsuite’s Pinterest strategy. From our internal advocates to our external Ambassador program, community is a core element to Hootsuite, and it spans across online and offline channels. In particular, using Pinterest, our community of internal and external subject matter experts (SMEs) share best practices and trends, expand brand awareness, and interact to learn from each other. For more Pinterest best practices, join the conversation using #smmw15 and check out Hootsuite’s Pinterest boards for more social media best practices. Elizabeth Houston has close to 20 years of experience in creating marketing communications, digital, and social media strategies. Working for a wide-range of companies including Cisco, EDS, PeopleSoft, and now Hootsuite, her main focuses are around community building, social and mobile strategies, education development, and social engagement.